Jeff For Banks: What will our depositors do when rates rise? 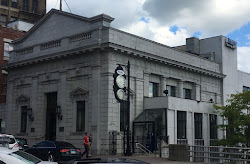 What will our depositors do when rates rise? The subject has been on the minds of bankers for years now. The continued extension of the Fed's easing policy through possibly 2016 has given us a sense of security. But this pro-longed period of low rates, burgeoning core deposits, and uncertainty about what our depositors will do next should keep us restless. For those that rely on yield for returns, it has been a tough time. Retirees, insurance companies, and bank treasurers have found it difficult to earn money in fixed income. Some have been able to squeeze gains out of bonds as rates fluctuated downward, but the second quarter flip from an unrealized gain to an unrealized loss in bank investment portfolios brought reality home to treasurers. I'm not certain what depositors will do when rates rise. But I analyzed what they did the last time the Fed raised Fed Funds Rates in mid 2004. On June 30, 2004, the Fed raised the Fed Funds rate from 1% to 1.25%. Over the next two years, the Fed raised rates 16 more times, ending at 5.25% on June 29, 2006 (see chart). The last Fed action prior to the 2004 rate rise was June 2003, when the Fed Funds Rate stood at 1%. Surprisingly, bank cost of deposits at that time was 1.43%. Note that all deposit and cost of deposit data was for quarterly periods, where Fed Funds rates were on the date they were raised. But once the Fed started moving rates up, bank cost of deposits lagged the movement upward. When the Fed ended its tightening in June 2006 at 5.25%, bank cost of deposits was 2.68%, a significant spread. What did depositors do during this period? They moved money from core accounts (all deposit accounts less time deposits and brokered deposits) to non-core, as shown in the chart below. But not to the extent one might think. Yes, non-core deposits as a percent of total deposits grew from 32% in June 2004 to 38% in June 2006. But core deposits did not decline during that period, growing 8.3% during the two year span. 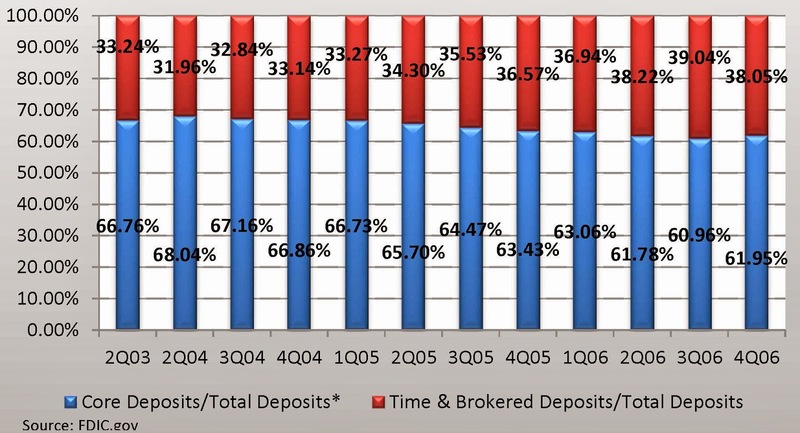 But time & brokered deposits grew 48.7% during the same period. 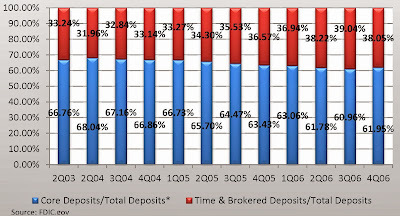 By the time the Fed stopped tightening in the second quarter of 2006, core deposits represented. 61.8% of total deposits. Today, core deposits stand at 77.8%. So, if past is prologue, then we can anticipate that although our overall core deposit base may not decline, time deposits are sure to increase. This analysis reviewed what happened to FDIC insured deposits across the U.S. How that money will flow between institutions is a result of efforts made by financial institutions today to win the loyalty of customers once rates begin to rise. Will they stay with you, or go across the street? Is it in your hands, or the hands of fate?